Are you grambling comfortably? Then I’ll begin. Once upon a time there was a young woman called Cinderella. She was called that because she had to clean the fireplace and was covered in cinders. I’m guessing it wasn’t her real name. Unless she was covered in cinders at birth, in which case we should be questioning the location of her mother’s bed when little Cinderella was born. And hygeine. Were the midwife’s hands covered in soot? If so, why? What was she doing? Anyway, let’s not dwell on it. For the purposes of this story, Cinderella it is. Now, it so happens that Cinderella’s family were a cruel lot. She was basically locked in the cellar of the house and never got the chance to venture out. She must have had terrible vitamin D deficiency. While she was having to clean out the fireplace in the cellar, her two older stepsisters... Did I mention that her dad had remarried? No? Well, he had... were swanning off down the shops buying lots of nice gear while Cinders wore rags. Well, why would she wear good clothes to clean out a fireplace. These sisters would then taunt poor Cinderella about her scruffy appearance. B*st*rds, thought Cinderella. One day, her sisters came down into the cellar to taunt her about a special invitation. ‘We’ve been invited to the Prince’s Ball,’ said one. ‘But you can’t come, because its a family ticket valid for two adults and two other family members only,’ said the other. ‘And anyway, you’re not pretty enough,’ said the former, which was a bit rotten when you think of it; her sisters were all dolled up and Cinderella was covered in soot. Hardly a fair comparison. And, frankly, the sisters were no oil paintings. In any comparison of aesthetics, Cinderella would probably have won. Indeed, if she had the chance to dress the way they did, she might have been quite a stunner, truth be told. Any road up, with a ‘MWAHAHA!’... that’s an evil laugh, by the way... the sisters left Cinders and headed off to the ball. Poor Cinders. She was left alone in the house while the others were all off boogieing on down at the prince’s party. What was she to do? As she sat and wept self-pityingly, a small mouse emerged from a hole in the skirting board. It stopped and looked at Cinderella. She looked at the mouse and asked it if it could help her. The mouse didn’t answer. It was a mouse and this isn’t a Disney story. Instead, it went back into its hole and didn’t come back out. Sod this for a game of soldiers, thought Cinderella, I’m not stopping here a minute longer. There was a small grating above the cellar, Cinderella often heard the sound of footsteps through it, so, she reasoned, if she shouted loudly enough, someone walking by might hear her. She got as close to the grating as she could and started screaming ‘Help!’ as loudly as possible. Luckily for her, a policeman, PC Buttons, heard her cries and quickly mobilised the police special operations unit who stormed the house and freed Cinderella. Yay! Her father was arrested and charged with illegal imprisonment and was jailed for a long long time. Meanwhile, after quite a bit of counselling, Cinderella sold her story to the highest bidder, wrote her autobiography, sold the film rights, appeared on several chat shows and toured the land as a speaker at various clubs and events. Of course she couldn’t have done all this on her own so her manager, and husband, ex-cop Buttons, masterminded her moneyspinning career. Wasn’t that a nice ending? Well, almost. You see PC Buttons was already married and had rather a large family. When he divorced the first Mrs Buttons to marry Cinders, Mrs Buttons was left penniless and with 16 children in tow and nowhere to live, she didn’t know what to do. She was so poor, they ended up living in a shoe... but that’s another story. Were any famous or notorious people born on the 21st of October? Of course. Here are some I’ve even heard of. Samuel Taylor Coleridge 1772 (Poet. Wrote Welcome to the Pleasuredome for Frankie Goes to Hollywood. ), Alfred Nobel 1833 (Invented dynamite and then felt guilty about it. ), Edna Purviance 1895 (Ectress. Was often in Charlie Chaplin films... and bed. ), Georg Solti 1912 (Conductor. Not sure which route he was on. 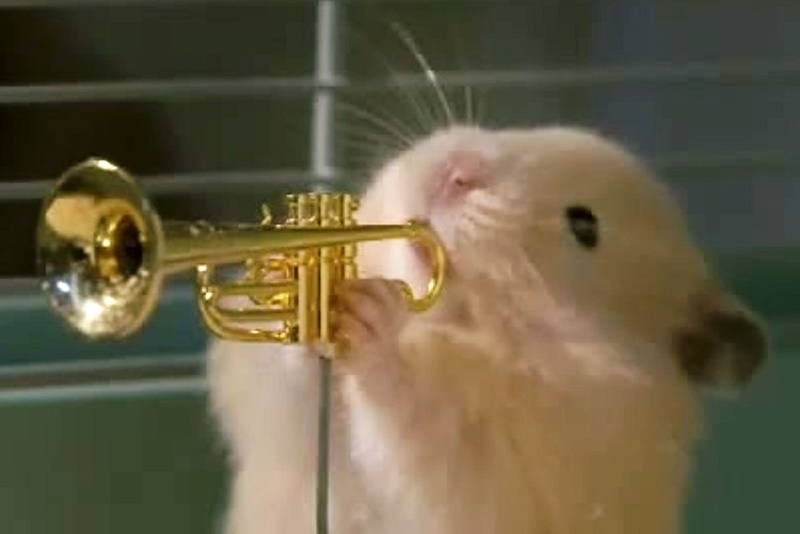 ), Dizzy Gillespie 1917 (Trumpeter and hamster impressionist. A clip? Why not. Here’s Tin Tin Deo. ), Malcolm Arnold 1921 (Composer. I say composer. If taking some traditional songs and doing them differently counts as composing, then he was a composer. What do you think? ), Leonard Rossiter 1926 (Ectaw. Rigsby. That was him. And Reginald Perrin. ), Shammi Kapoor 1931 (Bollywood window cleaner. ), Geoff Boycott 1940 (Cricket’s answer to Mogadon. ), Manfred Mann 1940 (Musician. Time for a clip? Here’s Manfred Mann's magnificent Moog. [Oh I say. - Ed. ]), Steve Cropper 1941 (Geetarist with Stax ‘house band’ Booker T and the MGs. Time for a clip? Do you like sweet potatoes? ), Tariq Ali 1943 (Writer, journalist, historian and political activist. ), Mandy Rice-Davies 1944 (Model and ‘showgirl’ famously involved in the Profumo affair. ), Eric Faulkner 1953 (A Bay City Roller. Another clip? Tartan scarves at the ready. ), Peter Mandelson 1953 (Politician. Wrote Fingal’s Cave. [Don’t think so. - Ed. ]), Carrie Fisher 1956 (Ectress. Famous for strapping a bagel to each side of her head. ), Julian Cope 1957 (Musician author, antiquarian, musicologist, poet and cultural commentator. In fact, a right old smarty boots. Here’s a hit from the early days with The Teardrop Explodes - Recompense. ), Paul Ince 1967 (Footy bloke. ), Kim Kardashian 1980 (Who? ), Nemanja Vidic 1981 (Footy bloke.) and Keiran Richardson 1984 (Footy bloke.). I was always a great fan of Booker T. and the MGs and recall a few hits they had... Green Onions, Time is Tight, etc.. I believe one of their tracks was used as theme music to cricket coverage by the BBC. Can you tell me the name of that particular tune? A Romaine Sawyers goal helped Brentford earn victory at Griffin Park as Millwall missed a late penalty. The Bees midfielder met Henrik Dalsgaard's pull-back with a close-range shot to beat Jordan Archer two minutes into the second half. But, with 10 minutes remaining, after a trip in the box, Lee Gregory's spot-kick was saved by Daniel Bentley. The visitors were 2-0 up inside 25 minutes - Jordan Hugill tapping in Sean Maguire's cross before Tom Barkhuizen's effort deflected off Maguire and in. Oliver Norwood halved the deficit with a penalty after Rui Fonte was fouled in the box by Calum Woods. Norwood forced Chris Maxwell into a late save, but the keeper then dropped a long ball, allowing Denis Odoi to level. Modou Barrow put the Royals in front in the 85th minute. Reading goalkeeper Vito Mannone saved an injury-time penalty from Pablo Hernandez after Samu Saiz was felled in the area. Nelson Oliveira headed an equaliser six minutes into injury time to rescue a point for Norwich City at home to 10-man Hull City. The Tigers looked set for a first away win of the season when, from Markus Henriksen's through ball, Nouha Dicko went clear to tuck his first goal for the club past the advancing Angus Gunn. Hull had David Meyler sent off on 57 minutes for a second bookable offence. Chris Basham's header four minutes after the interval was enough to give the Blades the points. Martyn Waghorn came close to an immediate equaliser when he struck the crossbar from Tristan Nydam's pass. Leon Clarke also hit the bar with an effort for the hosts. So, a poor week for The Grambler there. Can he/she/it redeem him/her/itself this week? [Probably not. - Ed.] What has he/she/it picked? The Grambler’s love affair with the English Championship has ended. This week every English division gets a look in. No Scottish games though. Less whopping than last week. Teaser time. Yay! Last week I asked you why Steve Heighway and Brian Hall were known as Big Bamber and Little Bamber in the Liverpool squad of the 1970s. The answer was that they both had university degrees. They were named ‘Bamber’ after Bamber Gascoigne, the question master on University Challenge. And finally, Cyril? And finally Esther, it has been a sad week for British comedy with the passing of Sean Hughes. I was a big fan of Mr Hughes’ brand of comedy right from the early TV appearances and have to say that I thought Never Mind the Buzzcocks was never quite as enjoyable after he left it. I recall his own show from the early 90s called simply ‘Sean’s Show’. Indeed, I must have liked it a lot because I bought his book called... can you guess? Sean’s Book. The book is, sadly, no longer in my collection. It was probably lent to someone long ago. I do remember a section that made me snort my coffee. He was bemoaning the strict censorship he had to endure while working on Sean’s Show. He was pulled up by the producers every time he said any words which they considered unacceptable and told to remove anything they considered offensive. As he tried to record the show, he felt that every gag was being spoiled by their intervention. Eventually, he becomes quite exasperated and pleads with them, ‘Is it okay to say ‘Screw you’?’ The producers consider this and one says, ‘Yes I think that is all right.’ Sean says, ’Good. Screw you!’ Well, I liked it.